Tips and hints on search engine optimization as they are published and distributed. I will try to keep you abreast of all Tips and Hints as they are published. Here are summaries and links to where you can download a pdf (requires Adobe) version. #1 See What Search Engines Find When They Visit Your Website – It Could Surprise You! First open a Google search box. Enter your site’s domain name, then click on the search function. In the results click on the upside down triangle at the bottom, next to your address. A picture of your Web site should open up as it appears on a monitor. Then click on “text-only-version” near the top right. All graphics and pictures will be eliminated and you will see the text or content search engine robots see. This is what is read and categorized (indexed) as part of the search engine matching process to a search engine query. Be on the alert if things look strange! Use this FREE independent rating tool to see how your Website scores. Go to http://marketing.grader.com/ from HubSpot. Enter your site URL and email. Save the link to a folder to compare to later results. You can also save the displayed report as a pdf file for future review. Contact me for a link to a FREE pdf creator if you do not have one. I’ll send a link by return e-mail with instructions! Please contact me for a no-obligation consultation if you need help interpreting the results or to improve your ratings to increase your traffic and resulting sales. #3 Is Your Company Listed for Local Search Results? Check to see if your company site is listed for local search results through Google, Yahoo and Bing (Microsoft) search engines. Go to http://getlisted.org/ enter your business name and zip code. Press < Check My Listing > and look for your results. If you need to add a listing or edit one, you will need a few things so I suggest you contact me for some recommendations…such as logos, photos, history, description, contact information, office/store hours, etc. You can even list if you work from home or have a mailbox drop. It might take a while if you do not have a telephone listed in a business name. Some sites may send a written snail mail confirmation. 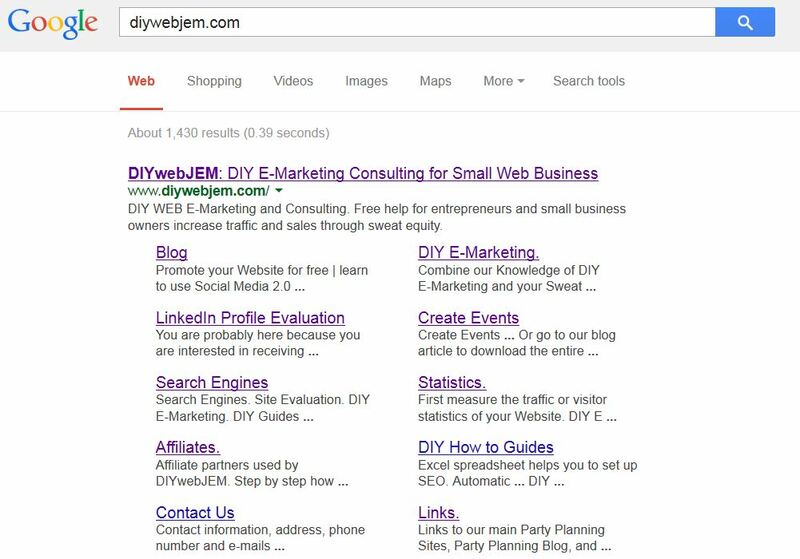 A Google results display normally shows these three lines of type: Title Tag, Meta Description, and Address/URL. Both the title tag and meta description should be different for each page on your Website. They must be specific to the content of that page. Otherwise you will confuse the search engines when they try to index the content and assign a page address to it. To get a complete list of titles and descriptions open a Google Search box. Search for: “site:your URL”. Do not include “http://www.” The results provide a complete list of every page on yours site as well as the page’s title and description information. Compare and correct for all duplications or omissions. Further information, a pdf download and instructions on how to get a complimentary Excel spreadsheet to help with the task are available Free of charge on our Website at https://diywebjem.com/titleandmetatags.html. Go to http://www.google.com/webmasters/tools/. Create a Free Google account if you do not have one. Click on the right hand side. Sign in once you receive it or if you already have one. Click at bottom of the new window. Information is available on the left sidebar. Type in your URL. Verification is next. The easiest way to verify now is using your Google analytics meta. Sign up for the Webmaster blog and look for YouTube videos! Even easier now. For set up a Google analytics account. Install the code. Then add Google Webmaster which you can then verify your account through the installed analytics code. Check the page rank of any of your pages at Page Rank Checker. I do not get too hung up on page rank since I focus on visitors, conversions and sales. Search engine results (SERP, where p = page) mean more to me and I have seen some sites with higher results and lower page rank. It is also not so important in this day and age if you are a local marketer. Page rank is a formula developed by Larry Page of Google. It is but one (albeit heavy) factor in determining search engine results. I just love Juicy Studio’s Readability Tests, especially when people tend to get professorial and egotistical. Hey, the Web is about sharing information not just tooting your own horn!